20 cm 208 p. : chiefly ill.
'Hey! There are pages missing in this book!' One day Tohko borrows a book from the library, but there are pages missing--sliced right out of it. There's no way the Book Girl, who loves books so much that she devours them, is going to stay silent about this! Caught up in Tohko's rampage, Konoha and his classmate Akutagawa are even forced (though they have no idea why) to perform a play for the school's culture fair. But Tohko and Konoha glimpse the darkness in his classmate's heart and of the madness that has driven him into a corner. A soul stands immobilized, bound up by the mistakes of the past. 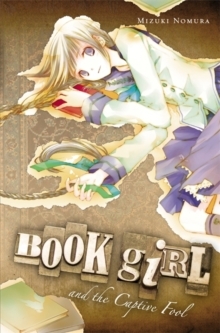 Will the Book Girl be able to set it free?